The staphylococci are implicated in a variety of human infections; however, many clinical microbiology laboratories in Nigeria do not identify staphylococci (in particular coagulase negative staphylococci - CNS) to the species level. Moreover, data from multi-centre assessment on antibiotic resistance and epidemiology of the staphylococci are not available in Nigeria. This study investigated 91 non-duplicate staphylococcal isolates obtained from the microbiology laboratories of eight hospitals in Nigeria during the period January to April 2010. Identification and antibiotic susceptibility testing was performed using the VITEK 2 system, detection of resistance genes by PCR, and molecular characterization was determined by SCCmec typing, spa and multilocus sequence typing (MLST). All the isolates were susceptible to mupirocin, tigecycline, vancomycin and linezolid, but 72.5% of CNS and 82.3% of Staphylococcus aureus were resistant to cotrimoxazole, while multiresistance was observed in 37 of the 40 CNS isolates. Untypeable SCCmec types (ccrC/Class A mec and ccr-negative/Class C2 mec gene complex) in two methicillin-resistant S. aureus (MRSA) were identified. Additionally, ccr-negative/Class A mec and ccr type 4/Class C2 mec gene complex was detected in one isolate each of S. sciuri and S. haemolyticus, respectively. The S. aureus isolates were classified into 21 spa types including two new types (t8987, t9008) among the methicillin-susceptible S. aureus (MSSA) isolates. Two (CC8-SCCmecnon-typeable and CC88-SCCmec IV) and four (CC8-SCCmec III/IV/V; CC30-SCCmec II/III; CC88-SCCmec IV; and ST152-SCCmecnon-typeable) MRSA clones were identified in Maiduguri (North-East Nigeria) and South-West Nigeria, respectively. The proportion of Panton-Valentine leukocidin (PVL)-positive MSSA was high (44.4%) and 56.3% of these strains were associated with sequence type (ST) 152. The identification of multiresistant mecA positive S. haemolyticus and S. sciuri from clinical samples indicates that characterization of CNS is important in providing information on their diversity and importance in Nigeria. There is the need to develop new SCCmec classification methods for non-typeable methicillin-resistant staphylococci, and to curtail the spread and establishment of the S. aureus ST152 clone in Nigeria. The study presents the first report of a PVL-positive ST152-SCCmecnontypeable MRSA and SCCmec typing of methicillin-resistant CNS in Nigeria. The staphylococci are part of the normal cutaneous ecosystem, but they are also opportunistic and invasive pathogens that cause a variety of human infections. Staphylococcus aureus is the most important human pathogen in this genus accounting for a high proportion of severe infections in hospitals and outpatient medical care [1–3]. Although the clinical relevance of coagulase negative staphylococci (CNS) is still controversial, patients at risk of CNS infections include neonates, those with intravascular catheters, prosthetic devices, postoperative sternal wound infections and immunocompromised hosts [4–7]. The remarkable ability of S. aureus and CNS to acquire antibiotic resistance limits therapeutic options, and morbidity and mortality rates of staphylococcal infections have increased the financial burden on health care systems worldwide [8–14]. Although there are reports on the characterization of staphylococci in Nigeria [15–18], many of the studies were limited to antibiotic susceptibility profiles. Moreover, one geographical region or health care institution was investigated, and CNS were not identified to species level. Only a few studies have investigated the molecular epidemiology and diversity of this group of organisms [19–23], however, they were not multi-centre surveys on S. aureus and CNS. This work describes a multi-centre study which was conducted in order to provide clinicians and infection control practitioners with information on antibiotic resistance profiles, molecular characteristics of coagulase positive and negative staphylococci, and to alert clinicians to the emergence of new clones in health care institutions (HCIs) in Nigeria. The study commenced with the request for non-duplicate staphylococcal isolates obtained from clinical samples processed in the microbiology laboratories of eight health care institutions in Ile-Ife, Ogbomosho, Iwo, Lagos (two centres) and Ibadan in South-West Nigeria; Jos in North-Central Nigeria, and Maiduguri in North-East Nigeria (Figure 1) during the period January to April, 2010. In this study, only staphylococcal isolates were analyzed and human subjects, clinical samples or human data were not investigated. All the hospitals, except the one located in Iwo, were tertiary health care institutions, each of which were at least 500-bed facilities providing medical care to about 500,000 to one million people. Preliminary verification as staphylococci was based on culture characteristics on blood agar, catalase, coagulase and DNase tests, while identification to species level was performed at the National Health Laboratory Service (NHLS), Groote Schuur Hospital, Cape Town, South Africa using the VITEK 2 system (bioMérieux, France) with the Gram-Positive Identification Card. 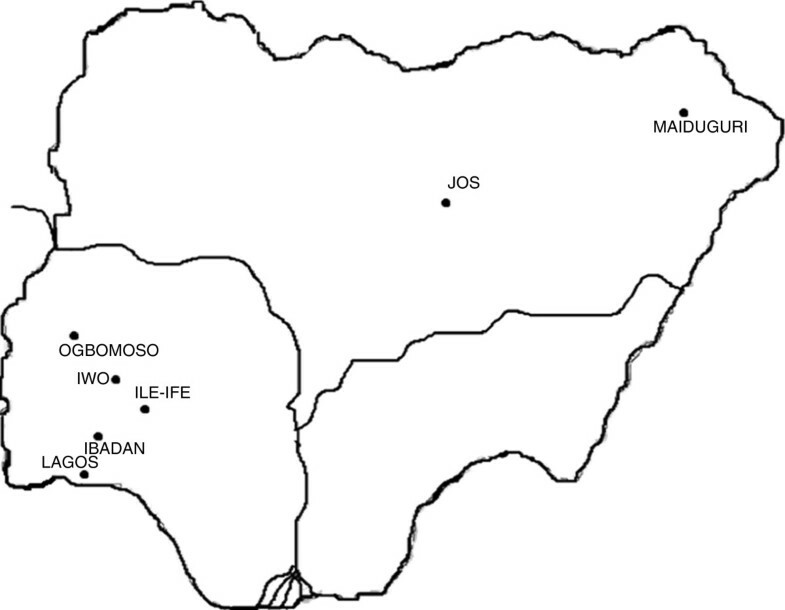 Map indicating the location of the health care institutions in Nigeria. Antibiotic susceptibility for penicillin G, oxacillin, teicoplanin, vancomycin, gentamicin, tetracycline, ciprofloxacin, moxifloxacin, trimethoprim/sulfamethoxazole (cotrimoxazole), fusidic acid, erythromycin, clindamycin, rifampicin, mupirocin, linezolid and tigecycline was determined by the broth microdilution method (VITEK 2 system, AST 603 cards, bioMérieux). S. aureus ATCC 29213 was the control strain and the VITEK 2 minimum inhibitory concentration (MIC) results were interpreted using the Advanced Expert System of the VITEK 2. Multiresistance was defined as resistance to at least three classes of antibiotics. Before DNA extraction, 5–8 colonies from an 18–24 h old culture on boiled blood agar was pretreated with lysostaphin (Sigma) (20 μg/ml for S. aureus; 50μg/ml for CNS) in 20 mM Tris-Cl, 2mM EDTA at 37°C for 30 min. The cells were harvested and DNA was isolated using a DNeasy tissue kit (Qiagen, Hilden, Germany). Phenotypic identification of the S. aureus isolates was confirmed by detection of the tuf gene as described previously . The PCR products were detected by gel electrophoresis using 2% w/v agarose (Seakem, Whittaker, USA) and run in 1X TAE buffer (pH 8.3) for 1 h at 100 V. Thereafter, the gel was stained with ethidium bromide, visualized under UV light and photographed using a SynGene Bioimaging System. The presence of the dfrA gene encoding trimethoprim resistance was investigated using the primer pairs: dfr-AF: AAT AGA CGT AAC GTC GTA CT; dfr-AR: AAG AAT GTA TGC GGT ATA GT and subsequent detection of a 289 bp product . The PCR conditions were as follows: Initial denaturation at 95°C for 3min, followed by 30 cycles of amplification at 95°C for 30s, annealing at 55°C for 30s, extension at 72°C for 30s and final extension at 72°C for 1min. SCCmec typing was performed according to a previously published protocol  using the control strains S. aureus COL (type I), N315 (type II), ANS46 (type III), MW2 (type IV), WIS (type V) and HDE288 (type VI). For non-typeable SCCmec elements, the investigation of mec complexes and ccr allotypes as described by Kondo et al. was carried out on representative methicillin-resistant S. aureus (MRSA) and CNS isolates based on their spa-MLST profile and location of the health care institutions, respectively. The profiles obtained were characterized and defined according to the current nomenclature used for MRSA . The presence of the PVL gene was determined by PCR using primers luk-PV-1 and luk-PV-2 . Typing of S. aureus was based on sequencing of the hypervariable region of the protein A gene (spa). The spa types were assigned using the Ridom StaphType (Ridom GmbH, Würzburg, Germany, version 1.5.21) . Multilocus sequence typing (MLST) was carried out according to the protocols described previously  on a representative isolate for the predominant and new spa types. PCR products were purified and sequenced at the Central Analytical Facility at the University of Stellenbosch, South Africa. Allelic profiles and sequence types (STs) were assigned using the MLST S. aureus database (http://www.mlst.net). Isolates that were not typed by MLST were assigned STs based on the Based Upon Repeat Pattern (BURP) via the Ridom StaphType software. Preliminary verification of isolates obtained from the microbiology laboratories in eight HCIs in Nigeria identified 91 staphylococcal isolates (51 S. aureus and 40 CNS) and the characteristics of each isolate are presented in Tables 1, 2 and 3. The clinical S. aureus isolates were recovered from wounds, skin and soft tissue infections (SSI), osteomyelitis and burns (36.4%), genitourinary tract infection (GTI)/infertility (18.2%), septicaemia (15.9%), urinary tract infection (UTI) (6.8%), otitis media (6.8%), bronchitis (4.5%), and 11.4% were classified as other infections (Tables 1 and 2). Six species accounted for the CNS isolates: S. haemolyticus (n=21), S. sciuri (n=9), S. saprophyticus (n=5), S. warneri (n=3), S. epidermidis (n=1) and S. hominis (n=1), which were distributed across four HCIs located in Ogbomosho, Lagos (designated as Lagos2), Jos and Maiduguri (Table 3). Most of the S. haemolyticus isolates were from the centres in Lagos2, Jos and Maiduguri, and 47.6% of the isolates were obtained from septicaemia, 14.3% from wound infections, 9.5% each from GTI, UTI, ocular-related infections, and those categorised as other infections (Table 3). ψ: Representative MRSA for SCCmec typing determined by Kondo et al. (2007). ¶Nasal samples of health care workers (HCWs) in one of the hospitals in Lagos (designated as Lagos1). Geographical region (Nigeria): South-West (Ile-Ife, Ibadan, Iwo and Lagos); North-East (Maiduguri); North Central (Jos). GTI: Genital Tract Infection; ASOM: Acute suppurative otitis media. Antibiotics - PEN: Penicillin; OXA: Oxacillin; GEN: Gentamicin; CIP: Ciprofloxacin; MOX: Moxifloxacin; ERY: Erythromycin; CLI: Clindamycin; TET: Tetracycline; FUS: Fusidic acid; RIF: Rifampicin; COT: Cotrimoxazole; *: Inducible resistance (clindamycin). UNT: Untypeable SCCmec types; NT: Non-typeable; ND: Not determined. Isolates with spa type t007, t074, t729 and t1603 were assigned STs based on the Based Upon Repeat Pattern (BURP) via the Ridom StaphType software. **: MLST on representative strains. ¶: Nasal samples of health care workers (HCWs) in one of the hospitals in Lagos (designated as Lagos1). GTI: Genital Tract Infection; SLE: systemic lupus erythematosus; SSI: Skin and soft tissue infection; UTI: Urinary Tract Infection; CSOM: Chronic suppurative otitis media. Antibiotics - PEN: Penicillin; TET: Tetracycline; CIP: Ciprofloxacin; MOX: Moxifloxacin; COT: Cotrimoxazole. ND: Not determined; NT: Non-typeable. Spa types (bold) are new types; Isolates with spa type t064, t159, t311, t318, t934, 1510, t2216 and t2304 were assigned STs based on the Based Upon Repeat Pattern (BURP) via the Ridom StaphType software. **: MLST on representative strains. KEY:ψ: Representative MRCNS for SCCmec typing determined by Kondo et al. (2007); UTI: Urinary Tract Infection; SSI: Skin and soft tissue infection; GTI: Genital Tract Infection. Antibiotics - PEN: Penicillin; OXA: Oxacillin; GEN: Gentamicin; CIP: Ciprofloxacin; MOX: Moxifloxacin; ERY: Erythromycin; CLI: Clindamycin; TET: Tetracycline; FUS: Fusidic acid; RIF: Rifampicin; COT: Cotrimoxazole; TEICO: Teicoplanin. *: Inducible resistance (clindamycin); ND: Not determined; NT: Non-typeable; UNT: Untypeable SCCmec types. All the staphylococcal isolates were susceptible to mupirocin, tigecycline, vancomycin and linezolid (Table 4). In addition to the antibiotics stated above, the methicillin-susceptible S. aureus (MSSA) were susceptible to teicoplanin, gentamicin, erythromycin, clindamycin, fusidic acid and rifampicin. About 94% of MSSA were susceptible to the fluoroquinolones and one isolate was susceptible to all the antibiotics tested. However, 80.6% of MSSA were resistant to cotrimoxazole and penicillin, but all the cotrimoxazole-resistant MSSA were dfrA negative. The predominant antibiotype was resistance to penicillin, tetracycline and cotrimoxazole, which was observed in 14 isolates (39%). Resistance to oxacillin was detected in 15 S. aureus isolates and confirmed as MRSA by the detection of the mecA gene. Of the 15 MRSA isolates, 13 were resistant to cotrimoxazole and tetracycline, while 6 and 7 MRSA were resistant to gentamicin and ciprofloxacin, respectively. Two of the 5 erythromycin-resistant MRSA expressed inducible resistance to clindamycin. Overall, 12 of the 15 MRSA were resistant to at least three classes of antibiotics (Table 1). The trimethoprim resistance gene, dfrA, was detected in only 3 MRSA isolates. All the S. haemolyticus isolates were resistant to penicillin, oxacillin and cotrimoxazole, but only one isolate exhibited resistance to fusidic acid. The proportion of S. haemolyticus isolates resistant to ciprofloxacin, gentamicin and tetracycline was 80.9%, 85.7% and 90.5%, respectively (Table 4). Furthermore, 5 (50%) of the 10 erythromycin-resistant S. haemolyticus isolates expressed inducible resistance to clindamycin, and one isolate showed intermediate resistance to teicoplanin (MIC: 16μg/ml). Multiresistant S. haemolyticus isolates were recovered from clinical samples in four HCIs in Lagos2, Maiduguri, Jos and Ogbomosho (Table 3). In contrast, resistance to fusidic acid was common in other species of CNS, and they were susceptible to erythromycin, clindamycin, teicoplanin and rifampicin (Table 4). The S. sciuri isolates were resistant to oxacillin and obtained primarily from various clinical samples in Ogbomosho (Table 3). On the whole, multiresistance was observed in 37 of the 40 CNS isolates, and the CNS isolates identified as methicillin-resistant (VITEK) were mecA positive. Fifteen MRSA were obtained from the HCIs in Ile-Ife (n=5); Maiduguri (n=4); Lagos1 (n=3); Ibadan (n=2) and Iwo (n=1). Using the multiplex typing method , SCCmec type IV was identified in two MRSA each from Ile-Ife and Maiduguri, SCCmec type III in two MRSA, one each from Ile-Ife and Lagos1, and SCCmec type II in one MRSA from Ile-Ife (Table 1). However, 8 of 15 MRSA and 28 methicillin-resistant CNS (MRCNS) were non-typeable. Based on another PCR-based method , two of the four representative MRSA and three S. haemolyticus possessed the SCCmec V element (ccrC/Class C2 mec). However, untypeable SCCmec elements were detected in two MRSA (ccrC/Class A mec and ccr-negative/Class C2 mec) and one isolate each of S. sciuri and S. haemolyticus (ccr-negative/Class A mec and ccr type 4/Class C2 mec gene complex) (Tables 1 and 3). One MRSA from Ile-Ife was PVL positive (Table 1). The gene was also detected in 16 MSSA, of which 10 were isolated from patients with SSI and septicaemia (Table 2). A total of 21 spa types were identified and representative S. aureus strains assigned as t037, t064, t084, t355, t2331, t4690, and new types t8987 and t9008 were selected for MLST (Tables 1 and 2). In MRSA, seven different spa types were identified and isolates with spa types t037, t064, and t4690 were assigned ST241, ST8 and ST152, respectively. Overall, the clonal complexes for MRSA were distributed across CC8, CC30, CC88 and ST152 (Table 2). In MSSA, fifteen different spa types, including two new types (t8987 and t9008) were identified of which only t064 was identified also in MRSA (Tables 1 and 2). The predominant spa types were t355 (8 isolates), t084 (7 isolates) and t318 (3 isolates) and a diversity of spa types (t318, t1510, t2304, t2331, spa non-typeable) were identified among the MSSA from nasal samples of health care workers (HCWs) (Table 2). MSSA isolates with spa type t084 and t2331 were assigned ST15 and ST8 respectively, while ST152 accounted for the new spa types (t8987, t9008) and t355. Nine and 11 of the 36 MSSA clustered with ST15 and ST152 respectively (Table 2). The identification of bacterial isolates to species level is of great importance in the clinical microbiology laboratory to obtain information on the diversity and significance of each species in human infection. Moreover, species identification is a prerequisite for epidemiological studies. Many clinical microbiology laboratories in Nigeria do not identify staphylococci (in particular CNS) to species level, which is important in understanding their variety and clinical relevance. Two species, S. haemolyticus and S. sciuri, accounted for the majority of the 40 CNS isolates investigated in this study (Table 3). Most of the S. haemolyticus isolates were obtained from blood culture samples in HCIs in Lagos2 and Jos, and S. sciuri from samples in Ogbomosho (South-West Nigeria). S. haemolyticus is regarded as the second most frequently isolated staphylococci from blood cultures  and one of the most clinically relevant CNS, particularly in immunocompromised patients . S. sciuri, principally found in animal species, and although not considered important from the clinical standpoint, has been associated with infections such as endocarditis , urinary tract infection  and wound infections [19, 36]. Multiresistance to antibiotics was detected in 37 of the 40 CNS isolates, and all the S. haemolyticus isolates were resistant to at least three classes of antibiotics. Apart from the possible clinical importance because of its serious impact on the course of infection, multiresistant CNS are a potential source of genes encoding resistance to antibiotics for other staphylococci pathogenic for man. The isolation of multiresistant mecA positive S. haemolyticus from blood samples (septicaemia) and S. sciuri from various clinical materials (Table 3) in some HCIs clearly indicate that they could be of clinical importance in Nigeria. A number of reports have indicated an increase in the resistance of staphylococci to cotrimoxazole in Nigeria [15, 18, 21, 23, 37]. In this study, 72.5% of CNS and 82.3% of S. aureus isolates were resistant to cotrimoxazole. The antibiotic has wide clinical application, inexpensive, orally administered and available over-the-counter where they are sold with or without prescription in Nigeria. This could possibly explain the high level of staphylococcal resistance observed in this study. Most of the cotrimoxazole-resistant S. aureus were dfrA-negative; hence more studies are needed to understand the molecular mechanism of resistance in Nigeria. Methicillin resistance in staphylococci is due to the expression of the mecA gene, which mediates penicillin binding protein 2a (PBP2a), a transpeptidase with low affinity for beta-lactams [7, 38]. The mecA gene is carried by a mobile genetic element (MGE) termed the staphylococcal cassette chromosome (SCCmec), and though the mec origin remains unknown, it has been suggested that mecA CNS may act as potential SCCmec donor accounting for the rise of new MRSA clones . Eleven SCCmec elements have been described to date: SCCmec I-IV [40–42], and V-XI [43–48], but few reports exist on the detection of mecA gene and characterization of SCCmec types in Nigeria [21–23]. There was excellent correlation between results of antibiotic susceptibility testing (VITEK) and detection of the mecA gene for the confirmation of methicillin-resistant staphylococci. However, the MRCNS were non-typeable using the multiplex PCR protocol . Based on the method of Kondo et al. , the SCCmec V element (ccrC/Class C2 mec) was identified in representative S. haemolyticus isolates, as well as untypeable SCCmec elements (ccr-negative/Class A mec and ccr type 4/Class C2 mec gene complex) in one representative isolate each of S. sciuri and S. haemolyticus (Table 3). Recent studies have indicated that SCCmec V is the predominant element among methicillin-resistant S. haemolyticus isolates [33, 49]. To the best of our knowledge, this is the first report on the characterization of SCCmec elements in CNS in Nigeria. It is likely that the mec gene complex and ccr genes in CNS are diverse and distinct, and as indicated in previous reports [7, 28], there is the need to develop new classification schemes for non-typeable SCCmec types in MRCNS. Molecular typing of the MRSA isolates indicated that two clones (CC8-SCCmecnon-typeable and CC88-SCCmec IV) existed in Maiduguri, North-East Nigeria, and four clones in South-West Nigeria (CC8-SCCmecIII/IV/V; CC30-SCCmecII/III; CC88-SCCmecIV and ST152-SCCmecnon-typeable) (Table 1). Previous studies on the epidemiology of MRSA in Nigeria identified MRSA clones t064-ST8-CC8 and t037-ST241-CC8 in South-West and North-East Nigeria, respectively [22, 23]. A community-associated clone, CC88-MRSA-IV, previously reported in Ibadan, Nigeria  was identified from wound and blood samples in Maiduguri and Ile-Ife, however, we were unable to determine whether the isolates were community-associated. Untypeable SCCmec types (ccrC/Class A mec; ccr-negative/Class C2 mec) were detected in two representative MRSA isolates, of which one was a PVL-positive isolate (t4690-ST152) from a patient with osteomyelitis in Ile-Ife (South-West Nigeria). The MSSA were assigned mainly to clonal complexes CC5, CC8, CC15, CC30, CC45, CC80 and ST152 (Table 2). A high proportion of MSSA from Maiduguri were grouped in ST15 or ST152 indicating that these clones were successful in North East Nigeria. PVL-encoding genes were detected in 16 MSSA (44.4%) isolates belonging to almost all clonal complexes identified in this study. Moreover, 56% of these strains were associated with ST152 and 10 of 16 (62.5%) PVL positive MSSA isolates were associated with SSI and septicaemia. These observations confirm previous studies that PVL-positive MSSA ST152 are widespread in African countries [50–52] including Nigeria [22, 23]. Furthermore, MSSA isolates (ST121) from nasal samples of HCWs were PVL positive. Our data suggests that the sequence types for pandemic PVL-positive MSSA identified in this study did not function as a reservoir for PVL-positive MRSA supporting the argument of Schaumburg et al. that the intimate inter-relation between PVL-positive MSSA and MRSA, which could lead to the emergence and spread of PVL-positive MRSA clones has not been established. However, the detection of an ST152-PVL-positive MRSA in this study suggests that surveillance for this clone is strongly advocated in Nigeria. This is the first multi-centre study on the characterization of coagulase positive and negative staphylococci using phenotypic and molecular methods in Nigeria. However, there were a number of limitations in this study. The number of isolates from the HCIs was low and variable which did not allow for comparison of data among the participating centres. Moreover, the diversity of the staphylococci analysed in this study does not represent their distribution patterns in health care institutions in Nigeria. Lastly, we could not conduct full characterization of the mecA-positive CNS isolates, and only representative isolates were selected for SCCmec typing and MLST. However, this study has highlighted the importance of species identification for CNS, their clinical relevance, and the need for longitudinal multi-centre surveys to provide data on antibiotic resistance and epidemiology of the staphylococci in Nigeria. Characterization of multiresistant mecA positive S. haemolyticus and S. sciuri from clinical samples is important in understanding their epidemiology within hospitals in Nigeria. The identification of untypeable SCCmec types in the study will be further evaluated and characterized; however, there is the need to develop new SCCmec classification schemes for non-typeable methicillin-resistant staphylococci. There is an urgent need to curtail the spread and establishment of PVL-positive MSSA, in particular, the MSSA ST152 clone, in Nigeria. We would like to thank the management of the hospitals for their support in the collection of the staphylococcal isolates. We also appreciate the assistance of Professor Mark Nicol, Dr. Eliya Madikane, Melissa Jansen van Rensburg, Malefu Moleleki (Division of Medical Microbiology, University of Cape Town, South Africa), staff of the National Health Laboratory Service (NHLS, Groote Schuur Hospital, Cape Town, South Africa), Dr Franziska Layer (Staphylococcal Reference Centre, Robert Koch Institute, Wernigerode, Germany), Professor Teruyo Ito and Dr. Xiao Han of the Department of Bacteriology, Juntendo University, Japan. We appreciate the comments and suggestions of Drs Edet Udo, Birgit Strommenger, Ulrich Nübel and Professor Iruka Okeke in the preparation of the manuscript. The research visit of AOS to the Division of Medical Microbiology, University of Cape Town, South Africa was supported by the visitor’s award by Clinical Infectious Disease Research Initiative (CIDRI). AOS, KO, AR, ST, FO, KO and GE participated in the design of the study. OO and FA performed the preliminary identification of the isolates. AOS carried out the molecular characterization of the isolates. All authors read and approved the final manuscript.